Well, we have talked a whole lot about Monday Night RAW in the recent times. But to say the truth, Tuesday Night SmackDown Live deserves a lot more discussion and appreciation. The WWE Universe was always made to believe that RAW is the superior brand. But if we see the recent results, SmackDown has established itself as a real competitor of RAW. Where RAW is facing crisis regarding viewership and attendance, SmackDown has continued to impress people to the level best as it always did. Both the superstars and officials of SmackDown Live have been doing a great job to make the brand valued. Vince has been doing and trying a lot of things to make RAW seem better, but all are in vain after the shows SmackDown has been putting. 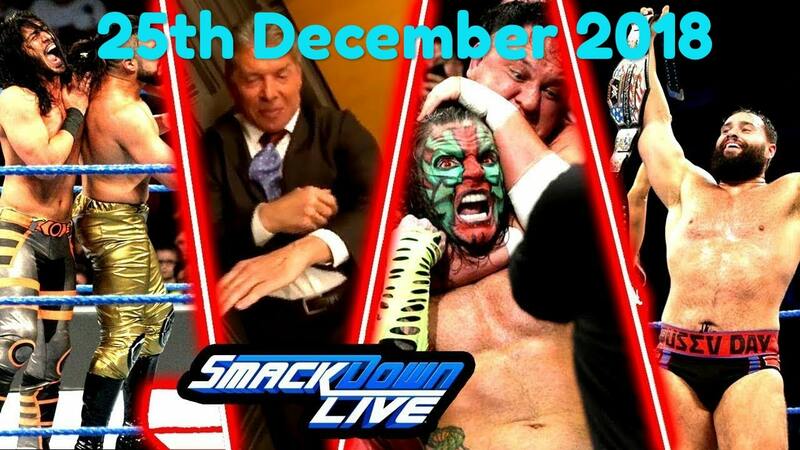 Leave aside this topic, let us look at what all happened in the SmackDown Live roster on 25th December 2018 on the eve of Christmas. As always, I will not go deep into the matches (links will be provided for each match on the list) and will just discuss and review about the matches. – SmackDown live kicked off with R-Truth and Carmella – dressed as Truthy Claus and CarmElfa – coming out to spread some cheers among the WWE Universe. But soon they were interrupted by WWE Champion Daniel Bryan. He came into the ring and talked trash about Christmas and Santa Claus ruining the Earth and that the North Pole would not exist after 20 years. He mocked Truth by saying that his career has been nothing less than a joke and that he could not even count till 30 regarding his Royal Rumble spot. And soon after he attacked Truth and justified his heel character. Note – Daniel Bryan has taken up his heel turn very well. He has dug deep into the character, and is a big reason for the increasing popularity of SmackDown. But targeting R-Truth was not that good, as I feel! Mustafa Ali picked up the second consecutive and perhaps one of the biggest wins of his career (after the match against Daniel Bryan) when he defeated Almas. The match was pretty fast-faced and full of action. And was full of action as well. There was no moment in the match when one would feel bored. Though Almas had the upper hand in the first part of the match, but overall the whole match was evenly poised. Almas kept Ali down and finally prepared him for his finish after he kept stomping the former 205 Live star. Almas finally went for the Double Knees to finish things off but Ali side stepped him and hit him with a DDT. Next on the line was his signature move 054 which sealed the deal. One could see that Almas’ advocate Zelina Vega felt the defeat more than Almas himself did. Why? No idea. Guess who were the guests and commentators for the match? The New Day! Particularly there was no story or build up for this match except the well known feud of The Usos and The Bar. But what the best point of the match was that the lesser known tag teams were the highlights of the match. But looking at the match up, it can be said that it was basically the face team versus the heel team. Gallows, Anderson and The SAnitY were particularly impressive more than The Usos and The Bar. A tough competition was seen in the ring between the 8 men present in the ring. Even there was a moment where we saw all the eight men breaking down each other. The match became somewhat a chaos, but the final moment saw the face team pick up a win after Gallows and Anderson hit Cesaro with a Magic Killer for the pin. The Miz can really start up his own show Miz TV in the WWE when he decides to retire because he is very good in the mic skills. And, the dream he had been seeing since last November finally was fulfilled after Shane O’Mac agreed to team up with him. The special guest on Miz TV this week was Shane McMahon. Shane said that changes were coming to SmackDown. He added that the WWE would listen to fans and bring new Superstars into the main roster while delivering new match ups. The Miz then narrated a story about his father. He started by saying that his father never told him “well done” after he did well in any match or even after winning any Championship belt. He added by saying that his father however was impressed after he saw Shane winning the World Cup in place of Miz and felt that they could make up a great tag team together. Finally Shane reluctantly agreed to team up with him, thus somewhat giving way to the baby face turn off the Miz. One hell of a fantastic match, which finally ended with no one winning. This rivalry started somewhat when Hardy was out in the ring to celebrate his 20 years in WWE. And, Hardy had now a chance to shut Joe up. Hardy went off to a strong start when he hit an early dropkick to Joe before continuing to dominate match into the break. We came back to see Joe taking back control with an Enzeguiri in the corner. Joe continued pounding Hardy until the latter hit a Whisper in the Wind. He followed it up with a Twist of Fate and looked for a Swanton Bomb but Joe rolled out of the ring. Hardy again followed Joe to the outside and continued hitting him without caring about his disqualification. But after the match ended, Joe out of nowhere locked Hardy in a Coquina Clutch which left him unmoved for long. Rusev started off with some massive strikes. The US Champion tried to counter by locking in a triangle hold but Rusev powers out and rolls out of the ring. Rusev replied with a series of suplexes but ended up eating a kick to the sternum for his troubles. The two men kept going back and forth until Nakamura found a big opening. He hit a knee to the back of Rusev’s head from the top rope. Nakamura looked to finish it off with the Kinshasa but Rusev replied with a Super kick. He tried to lock in the Accolade but Nakamura went for the Triangle again forcing the Brute to back off. Rusev dodged a Kinshasa and replied with a Machka Kick for the win. Rusev won the United States Championship once again. The ending moment of SmackDown Live saw The Chairman of WWE Vince McMahon confront AJ Styles backstage. Vince told Styles he was letting Daniel Bryan run the show and encouraged Styles to show his dark side. In order to bring it out, he slapped AJ across the back of the head and Styles replied with a right hand to the chairman of the board. Was he successful in bringing the animal out of Styles? Let’s see.